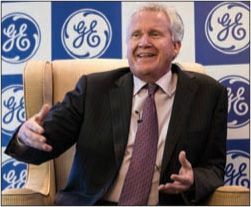 Jeffrey Immelt, who “dramatically transformed General Electric during his 16-year tenure” as CEO, is stepping down this summer, said Jon Chesto in The Boston Globe. “It was no secret that GE was looking for a successor to Immelt,” but this week’s announcement “came sooner than many anticipated.” Immelt worked to streamline GE by selling off the sprawling conglomerate’s appliances, finance, and media units to focus on bringing its industrial business into the digital age. But investors have grown impatient with GE’s sagging profits and sluggish stock performance. John Flannery, an Immelt protégé and the head of GE Healthcare, will take over as CEO in August. Flannery faces big questions about General Electric’s future, said Steve Lohr in The New York Times. Many investors are pushing for more streamlining in order to lift earnings and boost the company’s underperforming stock, with one analyst going so far as to call for an “‘AT&Tstyle’ breakup.” If that happens, Flannery will have to decide which pieces of GE make up its “corporate core.” Its jet engines and power turbines, which ensure years of lucrative service revenues, would almost certainly stay. But its healthcare business could be spun out as a freestanding company, and GE is reportedly looking to sell its storied lighting business. The Federal Reserve stuck to its timeline by hiking interest rates this week, said David Harrison in The Wall Street Journal. The central bank raised short-term interest rates by a quarter percentage point, to a range between 1 percent and 1.25 percent, reflecting its confidence in the stability of the economic expansion. Despite weaker-than-expected inflation data, the Fed appears to be holding fast to its long-term plans for gradually raising interest rates after years of allowing them to hover near zero. This week’s increase was the fourth since December 2015, with one more rate hike expected this year. Uber’s embattled founder and CEO Travis Kalanick took a leave of absence this week for an unspecified amount of time, said Mike Isaac in The New York Times. The decision followed the release of the results of a four-month investigation into Uber’s workplace culture led by former U.S. Attorney General Eric Holder. That report concluded the company “must repudiate its aggressive startup culture,” amid ongoing sexual harassment and discrimination scandals. Private-equity billionaire David Bonderman resigned from the board of directors, hours after he made a disparaging remark about women during an all-staff gathering. “Google is ditching one of its highest-profile robotics businesses,” said Alec Macfarlane in CNN.com. Japan’s SoftBank announced last week that it’s buying Boston Dynamics from Google’s parent company, Alphabet, for an undisclosed sum. The robot maker’s creations have gained viral fame for their unsettlingly lifelike movements patterned after animals. The sale “marks a swift exit” for Alphabet, which bought Boston Dynamics only four years ago but has since concluded that it is years away from producing a marketable product.